Mrs. Yollis' Classroom Blog: April is Family Blogging Month! 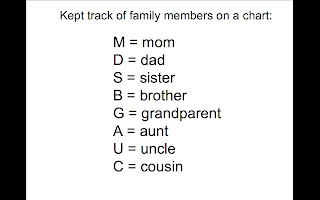 Each student will make a list of their family members. After looking through the archive, students will select specific posts tailored to the interest of a particular relative. We're inviting everyone to comment: moms, dads, brothers, sisters, grandmas, grandpas, uncles, aunts, and cousins. We welcome friends, too! Students will be inviting their family and friends to participate in our online spaces. Comments can me left on this classroom blog, our Yollis' 365 Project, our student blogs, or for our blogging buddies around the world. (See the archive) The top three bloggers will be proclaimed Family Blogging Month winners and receive honor and prizes. This year, awards will also be given for best commenters! designation will be by nomination. Who was able to bring about valuable conversations in the comment section? Parents and students are eligible for this high honor! Parents and friends, try to earn a 2-point comment! Have you ever run a Family Blogging Month? What are the benefits? I am Bryce and I am in a third grade class with Mrs. Yollis. Last year it was a split with second and third graders. This blog is not only a learning tool, but it is also helps you get to know more people around the world. For example, we know people in New Zealand, Australia, Canada, and in the United Kingdom. They all are bloggers and all of them have there own blogs. This year blogging gets more interesting because now kids can nominate parents or grandparents for best commenter if they have a conversation going. I have never won, but hope to be in the running of the top three or four bloggers. In November’s family blogging month I came in fourth, one away from third place. Sadly for me, Aashi beat me with one more comment. Lucky for Aashi she came away with that little edge that made third place hers. I remember when Mrs. Yollis called Aashi's name, and beat you by one comment! If I won, I would nominate the best parent, or grandparent because some of them are across the country, and it must take a lot of effort to comment from the other side of the country! I agree that it is hard to comment from across the country, so even if it was not the best conversation ever I would still give the relatives credit for just commenting. I also remember when they called Aashi's name and I thought that I had just lost by seven comments. Then when I heard Mrs. Yollis say Aashi won by one comment, I thought how did I let that happen. Please reply and keep the conversation going. I never realized all of the benefits of blogging until you were fortunate enough to get Mrs. Yollis as a teacher last year. We are all learning a lot from her! We live in a digital era now. Almost everything is computerized in some way. In fact, even our car has an internet connection that it uses to get traffic updates and reroute us if there is an accident on our route! It is so important to learn the etiquette of the internet and how to be safe in the cyber-world. You are learning life-long, valuable lessons from Mrs. Yollis. I am a pediatrician and I always talk to my older patients about internet safety. I tell them that the internet is much like the real world in that you should never talk to strangers. I remind my patients not to post what they look like, where they live or where they go to school. I am so glad that you and your friends are learning to be safe. Earlier I mentioned that we live in a digital era and that almost everything is computerized now. Do you know what an otoscope is? Did you know that my otoscope is attached to my iPhone and that I can save pictures taken with it? If you'd like, I will figure out how to post a picture taken with my digital otoscope. I am looking forward to blogging more this month. Good luck on the blogging race! Thank you for inviting us to be a part of this amazing blogging experience. I have learned so much from reading the posts and am anxious to learn even more. When I was in third grade, there was no such thing as a computer. I'm going to admit something. That was 1954, quite a long time ago education-wise. We learned from our teachers, from books we took out at the library, from encyclopedias and from newspapers. Of course, we learned from our parents, too. We didn't even have a TV! Every time we get to do homework together, I am more and more amazed at what you do on the computer. Spelling City and Mathletics are incredible! Having access to an encyclopedia on-line, in your own home, is fantastic! I think you are able to go to the World Book, which is the same encyclopedia I used as a child, different edition of course. Later, it was the encyclopedia of choice for your mother, too. Good luck during this blogging month. I promise to write again as often as I can. Hi Bryce -- thank you for your invitation to participate in your blog, which I am happy to do. You mentioned that you can meet people all around the world by blogging -- as you know, I travel around the world for my work with children. Hi Bryce -- Guess what I'm watching on television? Yes, I'm watching the University of Connecticut Women's Basketball team play in the NCAA finals. The UCONN men's team won the NCAA title yesterday as you probably already know. 1. On the back of the jerseys that the UCONN women wear, the only thing that appears is the player's number. No names are printed on the back of the jerseys to emphasize that it's a team game, not an individual effort. 2. UCONN women basketball team members are not allowed to have any tattoos. 3. When the UCONN women basketball team goes on the road, they are not allowed to wear jeans; they must wear a skirt or a nice pant suit. 4. Most of the starters of the UCONN women's basketball team are on the Dean's List for their excellence in academics. The UCONN women basketball team members must be role models for young girls in Connecticut and beyond; whole families take their children to see the UCONN basketball games. Ok, so it's half-time in the game now and UConn is ahead by 7 points. Hi again, Bryce -- this is Uncle Irwin again. The University of Connecticut Women's basketball team just won the NCAA championships. And guess what, BOTH the UCONN Men AND Women won the NCAA championships at the SAME time-- the SAME year! That only happened one other time when both UCONN Men and Women won the NCAA championships -- incredible! Ok, it's late and I have to go to bed but I'll blog more tomorrow, ok? Hi Bryce -- it is very early here in Maryland -- it's 4:44 AM. If it's 4:44 AM here in Maryland, do you know what time it is now in California? Thanks for posting all that information about the UCONN Women's Basketball Team. I lived in New England, Rhode Island, to be exact, and I never knew those facts. When you were at the University of Rhode Island or Cornell or UCLA, did they have those kinds of standards for their teams? I have no idea what the rules were for Yale or Boston University, but I'm going to look it up on the internet. I think we all need to be role models for each other. Bryce, what do you think? I think I can answer your question. If it is is 4:44 there it is 1:44 here in California. Thank you for a wonderful challenge. I say that because it is a three hours earlier here in California. Now I have a challenge for you. If it was 11:05 pm here in California what time would it be in Maryland? Hi again, Bryce. Guess what - it's 12:30 AM -- yes in the EARLY morning and I have to get up at about 5 AM so I can shower and get to the airport for my flight to California to see YOU, Hunter, your Mom and Dad, Gaga, Papa and Bubbie. We're going to have a great time together. I understand that you will be going to the baseball game tomorrow afternoon. If I make it to Gaga's and Papa's house before the game, guess who's going to be The Designated Driver to tomorrow's game, driving the 2 guys in the family to the game who have matching bum legs and feet! Yup, ME--good old Uncle Irwin!!! Hi Bryce -- oy! It''s 5:15 AM and I only got about 4 hours sleep last night. BUT, I'm going to see YOU, Hunter, your Mom and Dad, Gaga, Papa, and Bubbie this afternoon, so I'm not tired, I'm excited! We're going to have a great time this next week. First, there's Hunter's birthday, then, there's Passover. How come only the kids get to look for the Afikomen? I want to look for the Aficomen, too, and if I find it, I'm going to DEMAND a LOT of money from your Dad. Do you think he'll give it to me? How much do you think I should ask for? Maybe $1,000.00 -- all in new quarters!!! Well, I better get up and take a shower. I have another question -- why do they say "TAKE" a shower -- I'm getting wet... I use soap... water comes out of the shower head and washes the soap off, but I'm not TAKING the water anywhere with me -- can you imagine if I TOOK all the water from my shower with me to the airport? I don't think they would let me on the plane, do you? You're not allowed to even bring any liquids through security, so with all that water, I wouldn't even make it to the gate where the plane takes off! I think they need to change the phrase from TAKING a shower to "Experiencing a shower". That way, there's no confusion about anyone TAKING anything. Just think of all the showers I've "TAKEN" at Gaga and Papa's house over the years -- if I "TOOK" all that water from ALL the showers I've "TAKEN" at Gaga and Papa's house, there wouldn't be any water left at their house!!!!! So, what do you think about my idea to have a new phrase, "EXPERIENCE a shower" rather than "TAKE a shower"? Who should we speak to about changing that phrase? Do we have to go to Washington, DC and speak to the President of the United States about it? Does he need to get an Act of Congress to approve the new phrase, or a two-thirds vote from the Senate? Actually, I think I need more sleep, don't you????!!!! Ok, Bryce, that was an easy one -- if it's 11:05 PM in California, then it's 2:05 AM (the next day) in Maryland! That was easy -- try giving me one that's a little harder, ok? Hi again, Bryce... well, I just "EXPERIENCED" a nice hot shower and now I have to get something to eat quickly so I can drive to the airport soon. I think I might want some eggs, but I have 2 eggs in my refrigerator, and I'm not sure if they are hard boiled eggs or eggs that I just bought from the market. Do you know how to check an egg to see if it's hard boiled in comparison to an egg that is not? I'll give you the answer in my next post, but in the meantime, did you hear the one about 2 eggs in the refrigerator, one was hard boiled and one was just bought. The new egg that was just bought fell off the shelf and cracked open and all the contents, the yolk, the white part of the egg, everything, fell all over the egg -- he was gooey and messy, and the hard boiled egg said to the other egg, "The yoke's on you!!!!" Are you really my brother? Hi Bryce! Ok, so here's the answer as to how to tell a hard boiled egg from a raw egg. Take each egg and put them side by side on a table -- actually, place them about 6 inches apart from each other. Spin each egg -- like you are 'twirling' them. The egg that spins in circles very evenly and smoothly is the hard boiled egg. The egg that spins haphazardly or doesn't spin at all is the raw egg, since the insides of the egg, the yolk and the white of the egg, is sloshing around inside and therefore, you won't get an even spin on the egg! Cool, huh?! So now, if someone asks you to help them determine if an egg in their refrigerator is hard boiled or raw, you now know how to tell the difference without opening up the egg! Hi again, Bryce! Gosh, it was good to see you today at the baseball game. I can't believe how tall you've gotten since the last time I saw you, which was just a few months ago. And your boot looks really cool. I hope you're telling people that you broke your toe as you slid into home plate when the score was 5 all in the bottom of the ninth and that you ran from second base and slid into home plate in a cloud of dust for the wining run -- WHAM! The Red Sox win again 6 - 5 and Bryce Jacobson was the hero of the team sliding into home plate unconcerned about your own well being -- you just wanted to win for the team because you ARE a team player! Hi Bryce--good morning--very early morning -- it's about 5:30 AM here in California, but because I just flew in yesterday from Maryland, it feels like it's 8:30 AM for me -- time to get up!! Can you imagine how difficult it is to adjust to a different time zone when I travel to Africa to work? When I was in Zimbabwe, it was 7 hours ahead of eastern time, and I had to get up early and go to work -- THAT felt like I was getting up in the middle of the night! For example, if I got up at 7 AM in Zimbabwe, it was midnight the night before in Maryland, which was REALLY hard to do -- I had to get up, "EXPERIENCE" a shower (you didn't think I forgot our new phrase, did you?!!! ), eat breakfast and go to work - AND I had to STAY awake and be productive all day. Ok, so here's what happened when I went to Zimbabwe. I wanted to fly to Zimbabwe on Thursday, February 20th where the flight would arrive on Friday night February 21st. Then, I was supposed to have a meeting at 10 AM on Saturday, February 22nd, which is really 3 AM for me since my body was still on Maryland time. But, the good news is that I would have the rest of Saturday and all day Sunday to rest and make final preparations for my work, which would begin on Monday, February 24rh. Well, a funny (actually not so funny) thing happened to me at the airport in Atlanta. First, to let you know the flights, I had to fly from Baltimore, Maryland to Atlanta, Georgia in the morning, which is a pretty short flight -- about 2 hours. From Atlanta to Johannesburg, South Africa, the flight is 17 hours -- non-stop. Let me run this by you again, so you'll appreciate this -- I'm talking about sitting in one airplane chair for SEVENTEEN HOURS straight from Atlanta to Johannesburg, South Africa (now you can see why I said that the flight from Baltimore to Atlanta was "SHORT", since it was only 2 hours. Then, after a 4 hour layover in Johannesburg, South Africa, I took another final flight to Harare, Zimbabwe (Harare is the capital of Zimbabwe -- pronounced, "Huh-rah'-rey"). So we're talking about over 30 hours total of flying and waiting for connecting flights before I actually get to Zimbabwe when the flight arrived at 9:15 PM. Maybe you should look at a globe with your classmates and teacher to see where Johannesburg, South Africa is and where Harare, Zimbabwe is -- it is REALLY FAR AWAY FROM THE UNITED STATES!! This is Part-2 of Uncle Irwin's Blog to Bryce about my trip to Zimbabwe! Ok, so there I was at the Atlanta, Georgia airport about to board the plane. As you may know, I get to airports VERY early before a flight so I don't have to worry about missing a flight. I have always felt that the only way to deal with the unpredictable nature of traffic on the way to the airport or the unpredictable crowds AT an airport, is to get there early. I'd rather spend an extra hour or even two hours at an airport rather than be nervous and worried in traffic on the way TO an airport. Ok, so back to the Atlanta airport, which incidentally, is a very big airport. So there I am, all calm, cool and collected, Uncle Irwin, first in line with my boarding pass in one hand and passport in the other hand about to the agent at the departure gate. Now, before I proceed with the story, do you know what a "passport" is? Why not look it up with your classmates and teacher. I guess you can "Google" it. I'll give you a quick answer -- a passport is an official little book, about 4 inches X 3 inches with several pages in it, which is an official document issued by the US Passport Office, which has your name, birthdate, photo, date of issue of the passport, and date of expiration of the passport and an official passport number, which is 9 digits long (I know my passport number by heart since I travel internationally so much for my work). In the passport, there are several pages for agents at a country of destination to stamp in it showing that you have been allowed to be in the country. Many times, you need a "visa" for a specific country, that allows you to officially be in that country. For example, for Zimbabwe, I needed to either apply for a visa from the Zimbabwe Embassy that is located in the United States (an "Embassy" is an office, where in this case, officials from Zimbabwe work -- there are MANY embassies from MANY different countries around the word with offices in the Washington, DC area, near where I live. Ok, so you can apply for a visa from the Zimbabwe Embassy in Washington, DC. OR, another option in this case, is that if you are a U.S. citizen, which, of course, I am, then I can get my visa right on the spot when I land in Zimbabwe, which is what I did. Ok, so are you still with me? To set the stage once again, since we were all much younger when I started this story, there I am, good old Uncle Irwin, waiting calmly, FIRST in line at the departure gate in Atlanta Georgia with my boarding pass in one hand and passport in the other hand, when I gave both to the Delta Airlines agent at the gate to review and approve before I board the plane. He looked at my passport and calmly said to me, "Mr. Shorr, I'm sorry, you cannot board the plane." I thought he was joking, but then I realized he was not joking, so I asked him why, what was wrong? He told me that the government of South Africa requires that anyone going to South Africa MUST have 2 CONSECUTIVE BLANK pages (that's 2 pages side by side, right next to each other that are completely blank with no other stamps from any other country). I had 2 completely blank pages in my passport, but they were not right next to each other. This is Part 3 of Uncle Irwin's blog about his trip to Zimbabwe. Soooooo, what happened? That's right, I couldn't board the flight. I went to the customer service desk and a very nice lady explained to me that if the Delta Airlines person let me board the plane, when I got to Johannesburg, they would refuse my entry to the country, and send me back on a plane back to the United States! AND, if there was no plane right away back to the US, I would have spent the night in a South African JAIL!!! I'm not making this story up, Bryceroo -- this is actually true. Ok, so there's more -- if Delta Airlines let me go to South Africa and then I had to fly back to the US, I would have had to pay for my own airplane ticket back to the US, which would have cost THOUSANDS of dollars. And, wait, there's more -- if that had happened, Delta Airlines would have been fined $63,000.00 for their mistake. Yes, you read that correctly, SIXTY-THREE-THOUSAND-DOLLARS - that's' more than most people make in salary in a year!! So, I then had to stay in Atlanta for the night, and go to the U.S. Passport office, which VERY luckily, was in Atlanta, the next morning to have new blank pages inserted in my passport. I arrived at the Passport Office at 7:45 AM (the office opened up at 8 AM), thinking I would be early and the firs in line, but when I arrived there was already a very long line of people who wanted to either get their passports, visas, or like me, have pages added to their passports. Soooooo, nearly 5 hours later, I finally got my passport with new pages officially added to my passport. I had 24 new pages put into my passport (there's the option of getting either 12 or 24 pages added -- I asked them for 24 pages, which is more expensive and takes longer, but I thought it would be worth it since I didn't want this experience to happen again). Ok, so are you getting the picture here? I got to the passport office at 7:45 AM and left over 5.5 hours later at 12:30 PM, then, with newly inserted pages in my passport, I went back to the airport in time to board the plane to South Africa, which left the Atlanta airport at 6:15 PM -- needless to say, it's a long day at the office by the time I got on the plane. And, yes, the gate agent this time let me on the plane. Delta Airlines held my suitcase for me overnight, so I had just my carry-on roller bag and my computer. I always have an extra change of clothes in my carry-on bag and also all of my work with me that I take in my carry-on bag and computer in case my suitcase is lost. Now, you may be asking at least ONE question, and it's NOT "When is Uncle Irwin going to finally FINISH this story -- I'm almost 9 years old and I'm going to be TEN years old by the time he finishes with this VERY long story). The other question is, why did I need a passport for South Africa, when my final destination is Zimbabwe, which is a completely separate country? Well, the answer is that to save money, the organization that hired me to go to Zimbabwe to work on the national health and nutrition survey, bought 2 separate tickets, one round-trip ticket from Atlanta to Johannesburg, South Africa, and one from Johannesburg to Zimbabwe, so I had to get off the plane in Johannesburg, South Africa, go through immigration (that's the desk where they look at your passport to make sure you have 2 consecutive pages) where they put their official stamp in my passport, then I had to get my suitcase, and then re-check my suitcase in at the Johannesburg airport to Zimbabwe. Ok, this is Part 5 of Uncle Irwin's blog to Bryce about my trip to Zimbabwe! Whew! I think the story is almost over. Ok, so this all means that I arrived in Zimbabwe late Saturday night, had my meetings with my counterparts from Zimbabwe early Sunday morning, and then had to go to work the very next morning, Monday morning with almost no rest -- remember, Zimbabwe is 7 hours ahead of the time in Maryland (10 hours ahead of the time in California). WOW! I'm not sure I'm going to re-read this blog to you -- did you read it all? Did you understand it? What did you learn from this blog? 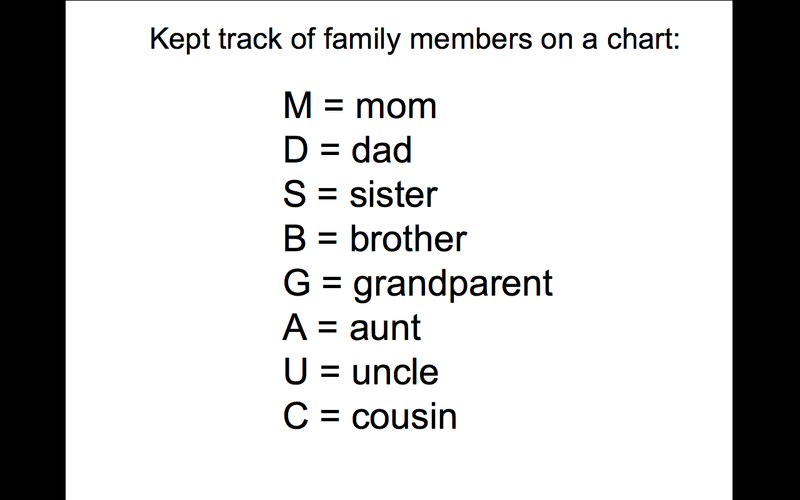 Can you and your classmates answer the following questions? 1. What is the time difference between Maryland and Zimbabwe. 2. What is the time difference between California and Zimbabwe. 3. What is a passport? 4. What is a visa? 5. Is Uncle Irwin a very long story teller? Oh, one more thing - I mentioned that my "final" destination was Zimbabwe (not South Africa) -- more on the funny phrases that are used about airplanes and flights in my next blog, which, maybe you and your classmates are thinking, "If Uncle Irwin is going to write an encyclopedia-long blog, I think I'm going to be absent from school that day!!!" I concur with you that it is hard to comment across the country or in other continents. I am very jealous of your family's typing ability. I hope you make the right nomination decisions if you win :-)! Tell your Uncle Irwin that he is a heck of a blogger! Ask Mr. Irwin if I wanted the Huskies to win the championship for me! Hi Bryce! Wow -- it's Friday afternoon about 4:15 PM and the day went by quickly. I did a little work on my computer this morning (very EARLY morning), then wrote you a VERY long blog, which I hope you got, then I went to visit my good friend Ron who lives in Los Angeles. Ron and I met in Belgium a long time ago, in 1971 when I was playing tournament tennis in Europe. Ron sprained his ankle then so I took his place in a team event in Belgium. Ron is a fantastic tennis player -- about 50 years ago, he beat Jimmy Connors not once, but twice, in Junior Davis Cup tryouts. He also played at UCLA and later was the Assistant Men's Tennis Coach at UCLA for 10 years. Then, I took Bubbie to the hair dresser at 1:30 PM and then came back here. Since you just walked in the door, I'm going to watch the Red Sox game with you! Hi Bryce -- remember that I told you that I take a lot of airplane flights to lots of different countries? Well, when I boarded the plane to go to Zimbabwe, the agent at the gate said to me, "Mr. Shorr, feel free to get on the plane" to which I responded, "No thank you, I don't want to get ON the plane, I want to get IN the plane. There are no seats ON the plane or seatbelts ON top of the plane -- I would MUCH rather get IN the plane where the seats are and the bathrooms". Also, the flight attendant said several things that just didn't make sense. First, as we got close to the airport in Harare, Zimbabwe, the flight attendant announced over the loud speaker, "Welcome to Zimbabwe!" Well, I have a problem with someone welcoming me to a destination who is getting there at the same time I am!! I think the welcome should be done by someone who is already there, like maybe the mayor's wife, or maybe the mayor himself!! Ok, so here's another thing the flight attendant said that I find very disturbing when she said, "If Zimbabwe is your final destination, please make sure you have all of the proper documents completed." Excuse me, aren't ALL destinations "FINAL"? I don't get it -- if it's not a FINAL destination, then it's NOT a destination, it's an oasis or a stop along the way to GETTING to a destination! All right, are you still with me? Here's another phrase that the flight attendant used that I have a problem with. The flight attendant then told us, "If you are getting off the plane at this time, please make sure to take all your personal belongings with you." Excuse me, aren't ALL belongings PERSONAL???!!! I think the flight attendant needs some help, don't you? Ok, so here's the really final thing that the flight attendant said that I was very concerned about when she said, "You can collect your suitcases in the terminal." You know, I get really worried about anything labeled as "terminal" when referring to airplanes! Why don't they simply call it a "building" where you get your suitcases?!!! Next time you're on an airplane, you can make a flight attendant laugh if you tell her some of the things I mentioned above! Hi Bryce -- wow! It's Passover again! And AGAIN, we are going to have a GREAT Passover seder at YOUR house! As I said in another blog, I want to be part of the gang who looks for the Afikomen. Do you know why it's called an Afikomen? Well, here's the answer: You take one half of a piece of matzoh and place it in an Afikomen cover and hide it. Because you take just one HALF of it, it's called the HALFikomen! If the whole piece of matzoh was taken, then it would have been called the WHOLI-komen, not the HALFI-komen!!! Do you think I'm silly? Hey, the above is TRUE! Ok, so if you believe that, then here's another Passover fact. The "Big M", that would be Moses, led all the Jews out of Egypt, and he did it by putting all the Jews in Hummer jeeps and took them across the dessert with tactical forces ahead to make sure that no enemies would head them off at the pass. There was radar and guided missiles along the way and troops dressed in nightgear with night vision goggles, and automatic weapons, as well as satellite video surveillance. When Moses and the Gang got to the Red Sea, he called in the Navy Seals to build a pontoon bridge to cross the Red Sea. Life boats with life preservers accompanied the Jews and The Big M along the way. There was extra SCUBA gear on board each life boat in case needed. There were at least 200 extra boats with Gatorade and McDonald's hamburgers for food. What?!! You don't believe that story???!!!! Well, if you hear the story I heard about how Moses led the Jews out of Egypt and across the Red Sea, you wouldn't believe THAT story either!!!! Hope you have "matzo" fun tonight with all of our family and friends! Hi Bryce -- wow, did we have a GREAT time this week together or what?!!! The week has flown by. The Passover Seders at your house were very meaningful and fun! Unfortunately, I did not get to join the kids in looking for the Afikomen, but that's ok, it was just great to be there with so much family and friends. You already know that I travel all around the world for my work. Sometimes I have traveled to countries during Passover. In 1977, I worked in a tiny country called Lesotho, which is located in southern Africa where I attended a Passover Seder at an Israeli family's home, who were working in Lesotho the same time I was there. Can you find Lesotho on a map of the world? In 1986, I worked in Bangladesh (can you find that country on a map of the world?) and I went to Calcutta, India for the first Passover Seder where I chanted the Torah at a beautiful synagogue in Calcutta, India (just a 30 minute flight from Bangladesh), where there are not one but TWO synagogues that are right next to each other on a street that was named "Synagogue Street"!! Cool, huh? While attending services at that synagogue in Calcutta, India, a very nice man asked me if I would come to his family's home for the Passover Seder that night, so I did! But it was a VERY long Seder -- it ended at 12 Midnight!! I was tired, but it was a wonderful experience. The synagogues in Calcutta were beautiful. I asked the man who invited me to his house for dinner, where the many Torahs came from that are in the synagogues in Calcutta. He told me that the Torahs came from Syria and Iraq, which used to have many years ago, thriving Jewish populations. As you can see, I have had many of life's experiences from my travels throughout the world. Hi again, Bryce -- tomorrow morning, I'm going to fly from Los Angeles to Baltimore, Maryland where I live. Ok, so here's a question for you and your classmates to try and answer. I took a non-stop flight from Baltimore to Los Angeles, which took 6 hours. BUT, the flight from Los Angeles to Baltimore only takes 5 hours -- do you know why? The distances are the same both ways, but it takes less time to fly from Los Angeles to Baltimore than it does from Baltimore to Los Angeles. Hmmmmmm.... see if you can answer this one!!! Well, you are off to the airport! It was a great week and you kept us smiling with your stories, just like you do here on the blog. We can't wait to see you again in a month after your trip to Ireland. Irwin, I hope you don't mind my telling Bryce and his class that you were the first American volunteer for an organization in Ireland called Concern. That was a long time ago. Bryce, you and your friends should take some time to look up the work that Concern does. In this world we need more people and more groups that do things to help others and make the world a better place. Class, are there things that you do or would like to do to help make this world a better place? Irwin, would you like to tell them about the ACTUAL work you do and about some of the famous people you've met? Hi Bryce -- well, it's about 4:30 in the morning and I'm having trouble sleeping, so I thought I'd write you. Today, Monday, April 21st is the second to the last day of Passover, and tomorrow is the last day. Now, I have a question for you, but first I want to set the stage for the question. You remember that we had TWO Seders at your house, right? Ok, here's another piece of information -- do you remember Rosh Hashanah? The Jewish New Year, right? Well, there are TWO days of Rosh Hashanah, and TWO Passover Seders -- why not just ONE day of Rosh Hashanah? The regular New Year is December 31st and that's New Year's Eve and then there's January 1st, right? That means that there's only ONE New Year's Eve (December 31st) but the Jewish New Year is TWO days -- so why do you think there are TWO days of the Jewish New Year and only ONE day for the regular New Year? If you answer this question correctly, then I have another similar question. Hi Bryce -- Today is Sunday. Next Sunday, May 4th, there is going to be a special event at my synagogue here in Olney, Maryland, B'nai Shalom of Olney (BSO), when representatives from the Israel Tennis Centers New York office will come to BSO and give a presentation on the programs of the Israel Tennis Centers. Last summer, I represented the United States as one of eight team members to play tennis in the Grand Masters Division of the World Maccabiah Games that are held in Israel only once every 4 years. The World Maccabiah Games is the Olympics for Jewish athletes, where last summer, over 15,000 athletes played a variety of sports representing over 40 countries from around the world. Every sport that you can think of that is played in the Summer Olympics such as rowing, basketball, volleyball, field hockey, badminton, gymnastics, and many more, are all played at the World Maccabiah Games in Israel. I was honored to play tennis in the World Maccabiah Games last summer, when I learned of the Israel Tennis Centers, a wonderful institution that serves over 20,000 children across 14 tennis centers throughout the country, almost all are in very poor areas. But the amazing thing about the Israel Tennis Centers is that they have a variety of programs for kids that goes far beyond just hitting tennis balls. There are programs for immigrant children (there are many immigrants in Israel -- can you name one country where many children are from whose families now live in Israel? HINT: It's an African country. Ok, to tell you more about the programs at the Israel Tennis Centers -- in addition to immigrant programs, there are "coexistence programs" -- that means that kids who are not Jewish who live in Israel learn to play tennis side-by-side with Jewish kids from Israel -- this way, they grow up together and learn about each other. Other programs at the Israel Tennis Centers include programs for special needs kids. The Israel Tennis Centers sends representatives to the Special Olympics every 4 years, but continue with their own programs in Israel on a daily basis. Also, there are programs to help kids with tutoring and homework after school. So the Israel Tennis Centers is a very special institution, and I have recently been appointed as a Board of Directors member, of which I am very proud. I'll send you a link to a 2 minute video about the Israel Tennis Centers where I actually speak for about 15 seconds -- I was interviewed last summer and didn't realize that I'd be part of the video! Pretty cool, huh? Hi, my name is Laura and I live pretty far away from California in the state of Florida. What's interesting about Florida is we have very similar weather to California. In Florida it is sunny and warm most of the year. We sure are lucky to live in such beautiful states! What do you like about living in California? P.S. I know your Gaga (Ellen). I have a 10 year old son named Nelson who likes many of the same things you like. Nelson's favorite things include: Minecraft, computers, Legos, robotics and animals. Keep up the good work on your blog entries!!! Thank you for leaving a comment for me! I like living in California because it has beautiful weather, and it has a large population which make it a good state for sports teams. I remember my grandma telling me about Nelson. We definitely have very beautiful states. I will keep up the good comments! What is his favorite part of Minecraft? What does he like about legos? I ♥ family blogging month! My name is Miles, Peter's little brother. This is my first comment, so if you see any errors, please don't get made at me :-)! I hope I get to leave more comments on this wonderful blog of yours, Mrs. Yollis. My name is Hunter and I am Bryce's three year old sometimes naughty little sister. Everyone thinks I'm cute so I'd put my self in the celebrity category. I love family blogging month. You are a good commenter, Miles, and I think that we would have a lot of fun playing together. Oh yes, I remember when Peter and Bryce had a playdate, and when I picked Bryce up I played a bit with you. Thank you for commenting back to me! I remember when you picked up Bryce and we got to play a little together. I have to say, Hunter, you are a excellent commenter. Much better than I am: :-). Next time Bryce comes over to Peter's house, maybe we could play! Do you like to play on a jungle gym? Ya that was fun playing together. I do like a jungle gym, but to admit it usually I just say yes to be cool. Although this time it actually is true. Thank you for saying I am a good commenter. I thought I am to. I admit that sometimes I can think that others would like the something that I like:-). Wow! Your mom's a really good commenter! I think that both our brother's are both good commenters. It's exciting that Bryce will have his own blog soon, and here is a link to Peter's blog, Peter's Blog. I agree that it is important to be safe on the internet, even if you want to look cool. Never give away your YAPPY on the internet. I remember Bogey and Birdie when I came over to Bryce's house. I agree they are cute. They should leave a post for Rocky, Buck, Gracie Marshmallow, Cooper, or Marco. I do not know what a otoscope is. I would like to see a otoscope being used. That would be cool. I hope to see more comments from you! I sent an email to Mrs. Yollis with an explanation of an otoscope as well as a picture taken with my otoscope. Until it gets published, I will at least tell you what an ototscope is. It is the instrument used to look in your ears. It has a light attached so that the doctor can see the tympanic membrane (ear drum) clearly. That way I can determine if a patient has an ear infection. Bryce's sister Hunter had an ear infection recently. She did not enjoy having her ears checked. Most patients don't think that it hurts, but some are scared. Hunter was VERY scared! Unfortunately, Evan (Bryce's dad) had to hold her down so that I could look in her ears. She is quite stubborn sometimes! Have you had your ears checked? Did it hurt? Some people say that it tickles. Did you think it tickled? Last November, I placed third in Family Blogging Month. This time, I am hoping to win second place. Kiera and I are competing for second place. Heather, the first place winner in November, told us she wanted to publish 99 comments in the 30 days that we have to win. Today, in class, Mrs. Yollis told us that we would be nominating other students that have been leaving quality comments. At that time, I thought I know a lot of tips on leaving quality comments. I should share my tips. So, that's what I am going to do right now. 2. Add new information. Pretend you're replying to your friend who likes writing about his two dogs. Let's say he took the time to write a whole step-up-to-writing paragraph. He probably put a lot of effort into that comment. You can add some new information to guarantee a reply. What tips do you have? Have you ever used one of these tips? If so, in what way did you use that tip? P.S. I got these tips from Mrs. Yollis' How to Write a Quality Comment video. You are welcome to watch it! I just wanted thank-you for sharing some of your tips about how to leave quality comments. Both your tips and Mrs. Yollis' How to Write a Quality Comment video are great places how to comment well. I have been commenting on my classmate's blogs and find that starting off by complimenting them on their idea and thanking them for sharing is a great way to start! I think you are all great commenters but one type I have learned about commenting that I would share is something I learned this year: spacing and length of comments are important. Try not to make comments too long- and be sure to space them out. I concur! Spacing out a comment is very important. If you leave it too long, readers might get tired and start loosing interest. If you leave it too short, readers will have less to compliment or to ask about. Unless you're writing a story, you should try to keep it in the middle. Here is a story about I person and two dogs that I have come to know. One day, little Arna wanted to play with Aashi, but Aashi had to finish homework and needed to concentrate. Arna begged and begged, but Aashi really needed to focus. Sadly, Arna waddled away with a frown on her face. Suddenly, she heard a noise coming from the backyard. Arna's mom or dad wasn't around, so she walked to the garage and pulled out a heavy bat. She dragged the bat on the floor while heading towards the backyard. She quietly stepped outside. Then she unexpectedly swung the bat back and forth dozens of times. Then she stopped and listened. The noise went away. So, Arna proudly went back inside. When Arna put her one left baby foot into the house, the noise came back again. It was Marco the Cowboy and Angus the Sleepy Pup. The were fighting because Angus took Marco's bandanna and wouldn't give it back. Arna stepped outside and tried to pull them apart. Suddenly, Angus said, "Yay! Arna's here. Help me keep this away from Marco. I know. We can play monkey in the middle!" "Give it back! Give it back!" screamed Marco. Arna took the bandanna and ripped it in half! "Did that solve the problem? I bet not. Well next time stop maken' so much noise!" Arna warned them. Arna was about to leave when one of the dogs spoke up. Can you make up a reason? Did you like my story? Family blogging month is off to a strong start. I can already tell that this is going to be a very competitive race with participation from the students and their families. The inclusion of the “Quality Commenter Extraordinaire” category is a great way to also recognize all the family and friends that participate in Family Blogging Month. After all the awards are given out, the winners will be all the students that participate and learn from this exercise. Let the race begin! I was doing some online reading and came across this a website called “Kids Learn to Blog” here is the actual website address. There was an interesting slide outlining 10 reasons why kids should blog. I have summarized the reasons below. Can anyone else think of other reasons in addition to the 10 below? What a fascinating comment! Thank you for the tips, and I will cherish them for when I get older. I agree with all the tips from Kids Learn to Blog. They are correct in my opinion. How did you find this website? What inspired you to share these tips with us? With blogging you can develop social skills for life. One way is that blogging helps you improve your typing skills. In class we're learning to type on a typing tool called an Alphasmart. With blogging, you can practice too. It's like the blog is a giant Alphasmart! 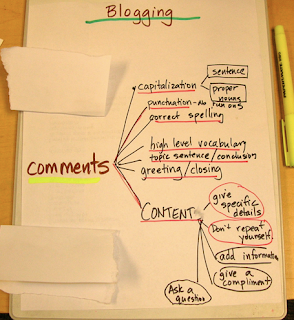 Another skill you can improve on with blogging is your vocabulary. Reading books helps you build your vocabulary, but commenting helps you put it to use. Can you think of other skill you can develop through blogging? Blogging is a very good resoure that helps you develop your writing skills. Blogging feels like you are writing a book, but it's really just one long page. all the things in the world, and most importantly, it helps you connect with other people and share. I’ve been thinking a lot about your posts explaining what we accomplish when we blog and what we can learn from it. I don’t know if my thoughts fit into any of those comments, but here goes. I really feel that blogging is a start to journaling. When we journal, we keep a record of our lives and of how we feel and react to what happens each time we write. It’s almost like the diary that I kept as a little girl. Mine was pink and actually had a key, so I could lock it every night. Well, I decided to “google” journaling and sure enough I found a lot of information. 1-We can solve problems when we journal, because we see our problems clearly after we’ve written about them. In blogging, we can also get help with our problems from our friends, family and teachers. 2-We can share our feelings. In blogging we can get great responses and support from our fellow bloggers. • “Clarify your thoughts and feelings. Do you ever seem all jumbled up inside, unsure of what you want or feel? Taking a few minutes to jot down your thoughts and emotions (no editing!) will quickly get you in touch with your internal world. • Know yourself better. By writing routinely you will get to know what makes you feel happy and confident. You will also become clear about important … information for your emotional well-being. • Reduce stress. Writing about anger, sadness and other emotions helps to release the intensity of these feelings. By doing so you will feel calmer and better able to stay in the present. • Solve problems more effectively… Writing unlocks other capabilities, and affords the opportunity for unexpected solutions to seemingly unsolvable problems. I was thinking that blogging could provide the same benefits with the help of others. Chloe, I was looking at your blog and you wrote about some of the amazing places you’ve been and some of the things you’ve done. Do you every think about keeping a journal of all these activities or is your blog your journal? Interesting question, if I do say so myself. I think family blogging month is great for getting families together and talking about ideas like how to use social networking and share stories with our families. I will invite my grandparents, my cousins, my parents, my sister, and my friends to participate in family blogging month. I look forward to practicing my writing while sharing stories with the people I love the most. It looks like you are off to a fantastic start with so many great comments and conversations. 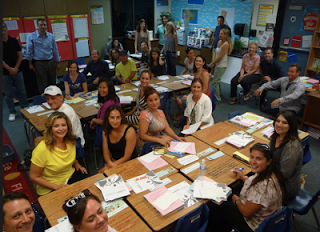 What an involved group of students and parents you have this year. As a parent of two former family blog winners, I don't recall that our competition was this intense. The real winners from this healthy competition is of course the students who will be practicing their writing skills. I have seen first hand how the skills they receive in your class will propel them to succeed in their subsequent years in in school. In fact, Sarah just received an award for her writing, and I credit it all to blogging and all she learned in your class. 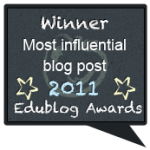 Practice makes perfect and blogging is a way for students to practice and have fun doing it. Good luck to all the students! I know! I cannot believe the level of quality with each comment! I appreciate you sharing your point-of-view as a parent of bloggers. Like you, I feel the quality practice makes all the difference. It is much more productive than any grammar worksheet I could offer. Please congratulate Sarah for me on her writing award! I remember both girls won a district writing contest last year too. How are you this morning? Papa (that would be me) is home and feeling much better today. I have my first physical therapy (PT) session at 11, as I start the road back to full recovery. For those of you who don't know, I had total knee replacement surgery last Friday. Watch out Bryce because by the time you get your boot off I want to be ready for a game of H-O-R-S-E! And I'm not going to let you win. Better start practicing your stroke. I will write you again after the PT session. We really liked your idea to include families in your blog. 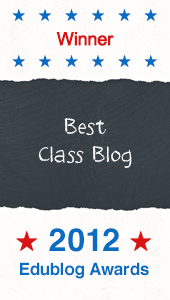 We are starting a blog just like you are and we invite you to come see our class blog (3rdgradethinktank.blogspot.com). We were inspired by your blog and are excited to get started. "Which of the following is a well-known phrase that includes the word 'knee'? All of these (Knee-high to a grasshopper, The bee's knees, Knee-jerk reaction). All these are common sayings. 'Knee-high to a grasshopper' (some people use other small animals such as a squirrel) is a way of describing someone who is small in height. A knee-jerk reaction describes a sudden, unexpected and automatic response to something, and originates from the knee's involuntary movement when rapped sharply with something. And the Bees Knees is the name of a great team on FunTrivia...oh, er...and also derives from bees, due to them carrying their precious pollen back to their hives in the sacks on their knees. It means of the utmost quality." I wanted to post a picture of the inside of Papa's new knee, but didn't know how. If you or any of your classmates knows how to post a picture, please teach me. In the meantime, I'll continue to search this website and see if there's an answer to my question here. That is good that Papa was a trooper. That must of been fun doing all exercises for one whole hour. I did not know that the knee was the most complex joint in the body. Those are interesting sayings. I wonder if there are any other good sayings involving the knee. I can tell you how to put in a post. I have a grand saying. "Lost time is never found." Thanks for the information about adding a picture to the blog. Now all I have to do is find the e-mail with the picture of Papa's new knee in the message, so I can send it! Sad to say, I didn't know who said, "Lost time is never found," but I looked it up on-line. The answer is Benjamin Franklin, one of my heroes. He also said, "Tell me and I forget. Teach me and I remember. Involve me and I learn." I love that quote. When you were very little and I was helping you learn how to read, I used styrofoam letters as an aid. I "told" you what the letter was and you didn't quite forget, but it didn't have that much impact. I "taught" you the sound of the letters and you learned a bit more. It was when I "involved" you in the process, by having you touch and feel these 3-D block letters and by playing games with them that you truly learned how to make words. I don't know if Franklin said anything about employing all your senses in order to truly learn and understand something, but it's a teaching technique that I believe in thoroughly. By the way, there is a great website, called "Brainy Quote," which exhibits a number of the great quotes of Benjamin Franklin and other famous people. Here's the link: http://www.brainyquote.com/quotes/authors/b/benjamin_franklin.html. Please tell me what you think after you visit the site. Also, do you have any heroes? Guess what? Isn't that a silly way to start a post? How can you possibly guess if I haven't even given you a hint? Well, I guess there is some small hint. I am writing in reply to blogs about Papa's physical therapy. So here goes. Guess what? Papa drove yesterday. How is your foot doing? Are you having any problem putting weight on it? Are you ready for your baseball games? Cool blog. I bet you are excited for the Red Sox this season. Hope they can come together and win another World Series. Come visit your cousins in Arizona. Hi Bryce! This is Ian your friend from New York. This blog is really cool! As for your baseball teams, they are anything but cool. Just in case you forgot, the Yanks beat the Red Sox 2 out of 3. I'm excited for another blow out by the Yanks today! How about you? Go Yanks! Hello, thank you for the compliment. If you know me well enough I would not like the Yanks to win. As a matter of fact, I was hoping for a blow out by the Red Sox. Sadly they are not on the groove they want to be on. It would be so much easier if the Red Sox won every game in the season. Grady Sizemore, for the Red Sox, is the only one on a complete hot streak right now. He has three or four homers, and he has about six runs batted in. I have him on my fantasy baseball team. Speaking of fantasy baseball I play you this week. I beat your dad last week by eleven points, and you beat my dad by a landslide. This week is different because your not going to be the landslide winner. I am going to be the landslide winner. I have only one start pitchers, but I have probably the best pitching staff in the league. If I remember correctly, I have the most strikeouts in the league with ninety. I am going to see you in about a week! When I am in New York, your dad, my dad, you, and I are going to a baseball game. We are going to see the New York Mets play the Miami Marlins. I hope we can agree on that we want the Mets to beat the Marlins. It is going to be a grand time seeing you. It was really great to see your post. It's so nice to have family that's involved. You are fabulous cousins. Do you ever think about seeing the Red Sox play? Does Arizona even have a baseball team? If they do, do they play the Red Sox? I was just wondering. It's me, Papa, checking in. I had my first PT (physical therapy) session. Man o'man, that was hard work. I have to do the entire program three times a day for at least six weeks. It's like teaching and training my leg muscles how to work all over again and learning how to walk all over again. But I'm going to work hard and beat you to the basket. I know your baseball team has a big game this afternoon and you won't be able to play and I won't be able to coach. But we will cheer on our teammates and hope for a win. I will talk to you after the game. I never knew that PT stands for physical therapy. I can believe that it was very hard to do physical therapy right after knee replacement surgery. We definitely had a big game and we came out on top 8-7. Now if the Orieles lose and we win we will be in first place by ourselves. Lets hope we win! This is my very first blog post ever and I wanted to thank you for the tips and pointers you gave me yesterday when we were together! I am so happy your baseball team was victorious yesterday, however I am sad that cousin Ben's Wisconsin Badgers were not as lucky in the NCAA Final Four in basketball:( Did you watch the entire game? It was close right until the end, but the Badgers lost by 1 at the buzzer. Tomorrow I am teaching a 3rd grade class at the school where I always substitute so maybe we can compare notes on our days after school tomorrow! You are welcome for the tips that I gave you yesterday while watching the Wisconsin Badgers game. It is very good for your first comment ever, and I really appreciate you commenting. I am proud of my team winning yesterday to. Although, I am also sad that the Wisconsin Badgers lost to the Kentucky Wildcats. That was a tight game till the end. If he had made the two Wisconsin would have won.However he did not make the two. With about four seconds left someone on Kentucky drained a three to give them the one point edge they needed. I would like to compare notes with you about school. We are learning about factions. What did your class learn? Did you watch the whole game? It was great to see you again today and I'm looking forward to seeing you again on Monday! Yes,I did watch the entire Wisconsin-Kentucky game. Our neighbors came over to watch with us and I think they were quite surprised to see how involved in the game I was! I had a full week at school. I taught 3rd grade for 2 days and had a 2nd grade class the other 3 days. In 3rd grade we are learning about probability and graphing data. On Friday we learned about line plots and earlier in the week we discussed probable outcomes and even played some fun games! Maybe we can play some together the next time I see you. Have you learned about collecting data and graphing yet? In Language Arts our 3rd grades are working on Biographies. Our 2nd graders are learning about ordering and comparing 3 digit numbers. We made some fun posters using what we learned. In Science we have been learning about motion and force. The class I was in worked in groups and created their own experiments demonstrating motion and force. They came up with some very creative experiments!! I enjoyed the pulleys they created. This week I will be teaching 4th grade, 5th grade and 3rd grade!! I hope I don't confuse them:) Uncle Tim and I are about to watch the movie Mandella: Long Walk to Freedom. Have you heard about Nelson Mandella? I will write more soon! My name is Lori and I am Alec's aunt. I am so thrilled to be a part of this blog. I think this is a wonderful tool for the whole family. We get to be involved with Alec's class even though we are not physically there with you. It's also great because it starts a conversation between us friends and family. Sometimes work and everyday activities prohibit us from spending as much quality time as we would like with each other. Kids: I know that video games and fancy gadgets are fun, but do you see the benefits of this blog? Will you spend more time researching different subjects and having new experiences that you can write about? I have not blogged much before so this is new for me. I am looking forward to browsing the different subjects and joining in on the conversation. I think Family Blogging Month is an educational way to talk, and sometimes also a way to communicate with others. I like to blog because I get better at typing. Thank you for the great comment! We both agree with what you said! We type in our classroom, but not just on the computer, we also have Alphasmarts. An Alphasmart is a typing machine that teaches, and challenges, you to type fast. There are many levels, such as: ASKL, DJF, GO, EI, and more! When you were a teenager, did you have a typing machine? I think that this is a spectacular way to encourage people to start blogging or to continue blogging. Even though I won two times already, I hope I will still win this time! What I am wondering about is that last year we only had one Family Blogging Month in November. I thought we were going to have one in April, like this time, but you never announced it. Why? Did we not have enough time, or do you do it every other year? My dad isn't really a big fan of blogging like I am, but I want to push him to start blogging! Usually, my mom participates in activities, but my dad is usually too busy and is always at his office working. Maybe I can get him to comment at night or on the weekends. :-D In your family, who doesn't really blog that much? Out of all of the people in the world, I chose to talk about myself. Firstly, I have an elder brother. My brother's name is Aaron, and he is in sixth grade. Mrs. Yollis knows him because he was in her class in 2010. Most of the time, he is just a regular person in our house, reading. One of my brother's favorite hobbies is reading fictional books. Where ever he goes, he always carries one book or another. :-D Second, I also favor a certain type of hobby, reading! My favorite genres are adventure, fiction, and mystery. The books have very interesting stories along with learning. When I read them, my whole body goes into the book as if I was a part of the story. Finally, I want to share my marvelous teacher. As you may know, this teacher that I am talking about is Mrs. Yollis. Before that, I didn't really like to read, write, or listen. When I popped up in Mrs. Yollis' class, my favorite hobbies were to read and to write! Now, I don't ignore the teacher while she is talking. Thank you, Mrs. Yollis! Clearly, I have a lot to talk about myself. Here is a hyperlink to my blog: Heather’s Perfect Post! This month we decided to plant a vegetable garden in our back yard. Has anyone else planted vegetables this year? We went to Home Depot and purchased many different kinds of vegetables including tomatoes, strawberries, peppers, onions and cucumbers. It will take about 60-90 days before the vegetables can be harvested. Planting your own garden is great because it teaches you where different foods come from and also how much work it takes to grow different vegetables. I can't wait to watch the different vegetables grow in our back yard. Planting a vegetable garden is such a great idea. I'd love to do it too, but I've always had problems with rabbits eating my plants. What do you do to protect your plants from various "critters?" Family blogging month is really getting competitive. Today I was in the middle of a meeting at work and Alec called me to remind me that I needed to post few blogs. I was not able to blog from work, but I did find some time to do it when I got home. I can't believe all the comments that people have posted since the last time I checked. Sometimes its fun just to read the different blogs that others have posted. I may start blogging from work tomorrow, or ask few of my colleagues to post blogs about their work. This is Alec's sister Ava. I am only 6 years old, so I asked my dad to help me post a blog. Did you know that we used to have a dog named Sam. He was a very nice dog and I really liked playing with him. One of Sam's favorite games was playing hide and seek. Although he is not here with us anymore, we always remember him and what a cute and kind dog he was. My name is Arbie and I'm Alec's Uncle. I'm pleased to see that Alec is beginning to blog and express his thoughts. I'm new to blogging so I will keep this brief. I was on my morning hike with my dog Biscuit when we noticed something was moving in the bushes about 30-feet away. We carefully approached the bushes and noticed a coyote was waiting for us. My dog Biscuit is only 15-pounds and she was terrified. I quickly grabbed Biscuit and ran back to my car. Although nothing happened I still will not go back to that hiking trail. Dear Arbie, glad to hear that you and Biscuit are safe from the coyote. Sounds like a very dangerous situation. Sometimes at night when driving home I see coyotes walking around in our neighborhood. They always run away when a car approaches. They are also pretty loud during the night and keep us awake. Lets keep all our pets safe by being alert and focused. You are so right. We need to keep all our pets safe. We also need to keep small children safe too. One morning we walked into the living room and found a coyote right outside the house. His nose was up against the sliding glass door in our living room. My heart skipped a beat. I was so glad the doors were closed. I keep reading all these blogs and can't help wondering how much time you have to spend reviewing and posting all of these blogs. I wanted to let you know much we apprecite all the effort it must take to get this done. Sometimes I post a blog late at night (past 11:00pm) and I see it posted few minutes later. Do you ever get any sleep? Thank you for mentioning how much we appreciate the hard work that Mrs. Yollis puts into this project. In fact, it is quite obvious that she puts a lot of work into every student she deals with and into everything she does. We all need to be grateful for the efforts of great teachers like this. They are a gift to our children and grandchildren and deserve our utmost respect. When I taught a very long time ago, we worked hard, but we didn't have computer classes and blogs as part of our curriculum. I thought having 50 children in a second grade class was overwhelming. I can't imagine what it would have been like to deal with new math, new computers, new everything! Thank you again for being our grateful voice. Thank you so much for the kind words about me. 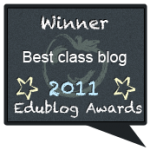 I am passionate about teaching and incorporating blogging and technology in the classroom, and I'm glad it shows! 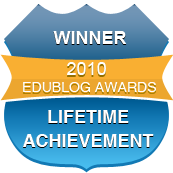 As a 27 year veteran teacher, I am continually amazed at the positive benefits that blogging provides. It's educational and fun! I was so happy to see that April is Family Blogging Month in your class because I think it is such a great idea! Mrs Yollis certainly comes up with lots of interesting ways to keep learning fun! I (along with my friend, Mrs Morris) have borrowed Mrs Yollis's idea of Family Blogging Month a few times over the years and it is always a great success! I may have to introduce my new class at Barwon Heads to Family Blogging Month at some stage this year. I also love the idea of awarding the "Quality Commenter Extraordinaire" to the person who submits excellent comments. I have never used the "2 point" comment system in my class, but I like the sound of it. I hope you all enjoy getting your families and friends involved in this special blogging month. Good luck! It's so nice that you are doing family blogging month this year as well. It looks like Family Blogging Month is getting very competitive. You have a lot of participation and great comments. I will never forget all of the great memories from being in your class in 2011. I recently won an award for the highest score in the class in writing. A lot of that credit should go to you for teaching me how to write and to blog. It was really neat that you, Hunter and Mommy stopped over this afternoon to bring me a treat of Golden Spoon yoghurt. Yummy! As you witnessed first hand, I am making good progress with my rehab. If you think schoolwork is difficult, try this sometime. It is hard work, but I am determined to be up and around long before anyone thought I would be. By the way, I was watching the Red Sox/Rangers game and Big Poppy hit a home run. The last score I saw was 4 -2. Tomorrow night your team has another big baseball game and I plan to join you in the dugout for at least a couple of innings. Go West Hills Red Sox! I know that baseball is one of your favorite sports. I wonder what sports your classmates like. I know a couple of them play basketball, but do they have a favorite? Classmates, let me know. I'd be really interested to hear from you. I am overjoyed by the quality and enthusiasm demonstrated on this blog. We are only nine days into Family Blogging Month, and the quality of the comments and the richness of the conversations are remarkable! Practicing quality writing enhances language skills. In addition, we all get to learn from one another in this online community! I appreciate the "Virtual Volunteer" parents and grandparents who are helping to comment back to my students. Students, I am so impressed with your ability to communicate your ideas in a thoughtful and articulate way! I am exceedingly proud! It was a nasty winter here in New York and we're all glad it's over. The weather here is finally turning spring-like, just in time for your visit! Grandpa and I are so looking forward to seeing you and your sister and Mom and Dad! We've been following your team (Red Sox) and grandpa even got a tee shirt that shows he's a New York Red Sox fan. Did your dad show you the picture? I hope your toe is better and that you’ve gotten back to playing with the team. I see that you’re studying animal adaptations. We have a family of rabbits living in our backyard (chipmunks, too!) and I often wondered where they went for the harsh winters we have here. They always disappear at the start of winter, but show up again in the spring. I just saw 2 of the rabbits the other day. Where do you think they go for the winter? How do you think they eat in the winter? We have squirrels, too, but they usually stick around during the winter. There’s a crabapple tree in our yard and the squirrels often find the fruit that drops from the tree and they bury it in the ground in the fall. I’ve watched them do that. They have even buried it in our planters! I wonder how they remember where they buried it. What do you think? I hope that you respond to my post. I heard that it was a hard winter in New York. I can't wait to visit you either! I saw the picture of the tee shirt. My toe is a bit better, but it is still in the boot. You mentioned that the rabbits disappear in winter. They probably take cover. When rabbits eat in the winter they probably hide it in the place and make it their home. What are crab apple trees? What do you mean by they buried in the planters? I am Theo's dad, Julien. This family blogging month is really impressive! The number and quality of the comments are great and it will take a real effort to catch-up. As foreigners (we are from France), we are sometimes a bit self-conscious when it comes to writing, especially since we know how much you care about spelling and syntax... But a great teacher once said you have to "push yourself", you remember Theo? Let me then share with you a couple of facts about our family. We have four kids: Theo and his three sisters. We moved from Paris to this community just three months ago. Living abroad is something common in our families. Theo has cousins living in Mumbai (India), Abu Dhabi (United Arab Emirates), an uncle who has just left Hong Kong and another one who will move with Theo's cousins to Shanghai just two weeks from now. The experience of living abroad and thus changing completely your lifestyle might be intriguing for some of you. Here is my proposal: ask us all the questions you may have about this experience and radical change in our life and we will make sure to answer, or even better, we will help Theo answer you. We are looking forward to your question. In my opinion, you are exceptional in English! How many years did you learn English? In my family, we have two children. There is my brother and me. All of my grandparents are in China, presently, and one of my cousins is in China. My other cousin is in California, and she lives about an hour away from here. I am the youngest child in my whole generation so far, and I don't really like being the youngest. My cousin that is in California is about in high school, my brother, Aaron, is in middle school, and I don't really know what grade my other cousin is in. My brother and I usually ignore each other, and my cousins don't play with either of us. I enjoy laughing with my parents, who are NOT in China. I have a question, do you and your family like traveling? All of you seem to be in different place all around the world, and I thought that you might like to go sightseeing. Did you know that we have visitors from all of these place that your family is living in? I have one golden retriever dog, and his name is Rocky. The photo in my avatar is Rocky, and he loves to fetch. Do you have a pet? Indeed, my wife Aurelie and I love to travel. In 2001, before we had kids, we traveled the world with our backpacks for 6 months. We visited South America, Australia, New Zealand, Vietnam and Cambodia, that was awesome! This experience has encouraged us to keep discovering new countries as much as we could. A great thing about traveling is summarized in a word I love: serendipity. Have you ever heard this word? It means when you are putting efforts into discovering something, you will sometimes discover something you did not expect, often much greater than what you were looking for... That is what traveling is all about. A fun fact about serendipity is that a couple of years ago it was voted one of the english words hardest to translate. That may explain why I find this word so interesting. My name is Alice and I am Theo's big sister. I am 11 years old and I'm in 6th grade at AC Stelle. Theo had told me that there is this family blogging month and I thought it would be funny to see all the comments and it will also encourage Theo because I know it is hard for him to write in English. In 6th grade, you will have to write many essays and paragraphs and I think it will be really useful to know how to write in a nice way. This was my contribution to help Theo and you can help him too by asking him questions and making him answer them. This morning I was thinking about beginnings, middles and ends. Don't ask me why I was thinking about that, but I was. It started with my thinking about some of the classes I used to teach back in Brooklyn, New York. I taught s special program for New York City's Bureau of Speech Improvement. We went into the schools to teach children certain concepts so that they could learn to read and one of those was the concept of "the beginning, the middle, the end." To explain a little further, a great number of these children never had family to read to them when they were little. They didn't know that in English we start reading from right to left. And they definitely didn't know the concept that I'm talking about right now. So, I drew a dog on the chalk board. First I drew its head and front legs and I asked the class if this looked right. They all yelled out, "No, that's not right!" Then I drew the dog's back legs and I asked if that looked right and once again they answered, "No, that doesn't look right either!" Finally I connected the head and the tail with a stomach, a middle, and asked them if THAT looked right. "Yes," they said. Then I explained that the dog was like a story. It needed a beginning, a middle and an end to be just right. Well, that memory brought me back to the thought of blogging and I was thinking that even blogs need a beginning a middle and an end. Can anyone guess what part of a blog would be the dog's head? What would be the dog's middle? What part of a blog would be its back leg and tail, the end? I just realized that there was an extra s in my last post? Does that mean I have points deducted? I'll have to do a better job of proof reading next time. It's Passover cooking time!!!! Potato kugels are in both ovens. Vegetables for vegetable kugels are being sauteed on the stove. The kitchen is a mess. The refrigerator is full. What could be better? And then tragedy! My microwave oven died. I can't believe it. Appliances aren't not supposed to die when you're cooking! I know that Mommy is busy cooking, too, since the Passover Seder dinner and observance is going to be at your house. You're having 25 or 26 people as guests the first night and 30 the second! For those who don't know, Passover is the holiday when Jews celebrate their freedom from slavery in Egypt. We say blessings and tell the story of the exodus from Egypt. It's a special holiday and it also reminds us that we must make sure that slavery does not exist anywhere, that we need to make sure that everyone has a good and healthy life where they can grow, prosper and live free. No matter what religion we ascribe to or even if we don't participate in any religion at all, it is important to stand up for justice, freedom and human rights. Do any of the other students in your class participate in activities that celebrate freedom? Do you? Yesterday was quite a day! We started off in the dugout together, both of us on the disabled list. Sadly we were joined by two of your klutzy teammates. We played a spirited game and even though we were down 3 players and a coach, we hung on, although we did lose 9 to 8. From your perspective on the bench, what were the highlights of the game? After the game we went to Hunter's 4th birthday party. It was an all girls' affair with lots of makeup, nail polish, singing and dancing. Did you have as much fun watching as I did? After the party we went back to your house to watch Hunter open her presents and have pizza. That was fun too. It was neat seeing you taking the pictures and having as much fun as Hunter as she opened her presents. Which one did you like the best and which one did Hunter like the best? See you tomorrow for Seder #1. I can't wait to see what Daddy has cooked up for this year. I already know what Mommy and Gaga have cooked up, because they've been cooking for weeks. P.S. Thank Mrs. Yollis for us for making it a no homework week, so we can all enjoy the holidays. The family emigrated to England. Dave's father Kasriel was a cabinet maker and worked for a while in Cardiff in Wales. Although most of the family lived in Manchester, a sister, Sadie travelled to the United States and met and married Nathan . She set up a home on the west side of Chicago. Dave missed his sister very much and decided to travel to visit her. He arrived in Baltimore in 1909 and travelled by train to Illinois. Nathan owned a coffee manufacturing business and took Dave in to help him. Dave lived with his sister for over 20 years and was a great uncle to his two nephews, Sanford and Irving. In 1927 Dave became an American citizen and remained for the rest of his life a proud American. Communication of whatever kind was so different in those days. In 1930 Dave wanted to visit a brother, Barnett whom he had not seen for so many years and was living in South Africa.It was a long voyage by ocean liner, first to Southampton in England and then from there across the Atlantic Ocean to Cape Town. In South Africa, Dave would not only see his brother but also meet my mother, Nina, an immigrant from Lithuania.The two married in 1934 but Dave never returned to the U.S. and was to spend the rest of his years in South Africa. My brother Allan was born in 1939 and I was born in 1944. Soon after each was born our father registered us at the Unites States Consulate in Cape Town as Americans! Dave, your great-grandfather, died in 1961 at the age of 73. He is buried at the Pinelands Jewish cemetery and on his tombstone it is inscribed "A heart of gold, one of the best the world could hold." And that describes him so well. A kind and gentle man, always concerned for others. Thank you so much for sharing your touching story. It is so important that our children and grandchildren know their ancestry. Hopefully more people will do as you have done and write down your history, so it can be passed on as a legacy to your family. We have a tape recording of Bryce's Maternal Great Grandmother. Hearing her voice moves us deeply. While my 91, almost 92 old mother is still alive and living with us, I hope to get her to share more of her stories. Thank you for reminding us to do that. It was a great pleasure for me to share some family history with my beloved granddaughter, Jemma. Unless one shares stories of past years and family history with grandchildren, that history will be lost. I hope to write a book or booklet about my father’s life and travels one day. I once wrote about my childhood and young adulthood dog, Bingo!! I like the idea of voice recordings. Hearing and remembering the sound of people’s voices who are deceased does have a very special poignant impact. Perhaps as close as one can be with them again for a fleeting moment. I like the idea of voice recordings . Hearing and remembering the sound of people’s voices who are deceased does have a very special poignant impact. Perhaps as close as one can be with them again for a fleeting moment. Last night it was so wonderful seeing you actively participating in the Passover seder. I was especially impressed with your wealth of knowledge about the Passover story and the many symbols we spoke about. Clearly you have been listening at Hebrew School and I'm proud of how you embrace learning in different settings. We are very fortunate this year to have my entire family visiting us from all over the country for Passover. It is a rarity for us to all be together and it was a very special night. You love spending time with your uncles, aunt and grandparents. Your face especially lights up when you play with your 3 year old cousin from Washington DC. I hope you always remember these special times! I am David, Jemma's uncle. About five years ago I decided to embark on a open water swim in the ocean. This particular swim is from Alcatraz prison to the shore of the San Francisco bay. It is a 1.5 mile swim. People from all over the world travel to San Francisco so that they can compete in this swim. This endeavor is particularly difficult in that one has to cope with very cold water temperatures usually ranging between 57 and 62 degrees. The other challenging part is that there are very strong currents and if one is not careful the currents can pull you way off the course. Before the race begins the race supervisor informs us of the days current and what we should aim for on race day. Most people attempt the race wearing a wetsuit, as this keeps the body warmer. It is also not uncommon for a seal to pop up in front of you and say hi. In addition there are supposedly baby sharks swimming below. When you complete the swim you will receive a very impressive medal. This will hopefully be my sixth year participating in the swim and I can tell you it is an unbelievable experience. I recommend it to anyone looking for some sort of swimming challenge. Thanks for letting me share this experience with you! Thank you for sharing your story about the swim between Alcatraz and San Francisco. Do any senior citizens compete in this swim? When I was in high school and college, I was a lifeguard and swimming was my favorite sport. As I grew older I used to swim a mile a day. I'd love to go back to swimming and this competition sounds amazing. My grandma's name is not Gag, it is Gaga. In actuality her name is Ellen, but I call her Gaga. I'll tell her to proofread her comments. There are some senior citizens that participate in this swim but not many. I hope you can get back into swimming and that you have the opportunity to do the Alcatraz swim. Happy Spring Break! I can't believe that your spring holiday has finally arrived. Both of us have big plans for next week. On Monday, you go to speak Dr. Allie and we are all hoping that you will be able to throw away your boot for good. New Rule: When we play sports in the house, we both have to wear shoes. Also on Monday, Papa goes to have his staples removed. The rest of the week will be fun time for both of us. Do you have any really special plans for your week off? Gaga and I have some plans and I hope the doctor doesn't rain on our parade. Have a great week. Papa wrote his post about spring break and I thought I would add something that you and your classmates probably know already. When it comes to social media, we have to be very careful about posting where we're going and where we are. If I'm going to be away for a week, I don't want the world to know that my house may be empty. Although in our case, Bubbe and Edna and Tia would be here the whole time. It could be dangerous. It also could be dangerous to let people know where we are, if it's not at home. I think I'm going to do some research about safety on the internet. I'll come back and post what I find. This is Papa checking in on you. It was great having dinner with you and Hunter and Kelsey (and mom and dad too) last night. I hope Kelsey had enough to eat because he didn’t seem to be enjoying the sushi too much. How was the sleep over? Did the two of you get any sleep or did you talk all night? Gaga and I went home and had a very busy evening getting ready for my next round of therapy. Yesterday was good day for both of us. I had my staples removed. Would you believe the doctor used an old fashioned staple remover? I figure he would have some hi-tech gizmo that would remove them. Nope. He plucked them out one at a time. And there were lots of them to pluck! And you were told that you are almost completely finished with your boot. It is important that we both listen to our doctors so we won’t have any problems with our damaged parts later in life. Today I’m sure you are busy playing with Kelsey, packing for your trip to New York, and getting ready to go see the Kings play San Jose. Do you think they can turn things around and get back in the series? I hope so. Do you remember all those posts about the positive aspects of blogging? Well, I have a very special one to write about right now. 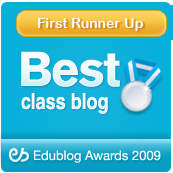 Thank you all for having this classroom blog. Thank you, Mrs. Yollis, for giving me a great gift, because that’s what this blog is doing. My mother will be 92 on May 18th. She doesn't often speak about her past. Whatever the reason is doesn’t matter. What matters is that now she is talking. So your blog is giving me the gift of my mother’s history. Since wanting to write a post like everyone else was, she has been talking about her life. The days are filled with wonderful stories and some that are a little hard to hear, too. She wants Bryce and Hunter and Sloane, too, to know about her life. And I am also learning more than I knew before. So blogging gives us the gift of history, of life and of wonderful stories. It gives us the gift of our loved ones. There aren’t enough thank you's in the world to express my appreciation. Please continue to ask questions of your family members. Write them down and save them, so you can pass them on. And don’t forget to keep writing your own story and your own feelings down too. They are who you are and there are people who really want to know you. How are you enjoying New York? I see the temperatures are on the cool side and it is cloudy today. This morning I got up early and did my exercises overlooking the ocean. It was drizzly and cool (I even had to wear a sweatshirt) but it was so nice. This afternoon the sun is shining and the temps are near 80. I understand you went to visit Uncle Bruce and Aunt Ro this afternoon. What did you do and did you have fun? Did you and Uncle Bruce discuss his beloved Rangers? Last time I looked they were losing today, 2-1, but up two games to one in the series. Gaga and I had a very lazy day today. I did all my exercises by the ocean and we just rested. Next week I will go back to the office for a few hours each day. Did you send your teammates a good luck message before tomorrow’s game? Coach Jerry said everyone is expected to play (except you) and everyone will be in the lineup for Tuesday’s big game against the Rangers. Next week you and I will spend a few minutes each day working on getting you back in the groove for your swing. Have a great time with everyone tomorrow. Sounds like a very busy day that will be topped off with the Angels beating the Yankees at Yankee Stadium. Our vacations have come to an end and it’s time for you to get back to schoolwork and papa to get back to work-work. I know you and everyone had a great time visiting with daddy’s family in New York and especially playing with Jenna and Jocelyn. Vacations are a time to have fun, create memories, and form wishes for the future. Tell me about Jenna and Jocelyn. Have they grown much since I saw them last year? How are they enjoying school? What are their plans for the summer? It would be neat if they could come visit with us for a week (or more) this summer. I just received an e-mail from Coach Jerry telling me about yesterday’s game. It was a real nail biter that we won 3-2 by scoring a run in our last at bat. I can’t wait for you and I to get back to playing and coaching this week. We have a game Tuesday and another Saturday. You and I will do some practice swinging after you finish your homework Monday. I’m going to pick you up at school. I hope you had a good flight home. I can’t wait to see you and the family tomorrow. This is going to be a short blog. I have coffee to clean up. Papa and I were sitting outside, getting ready to blog and to read the papers. Papa had his drink and I had my coffee. It was a perfect setting. Well, I sat down at the computer with my coffee behind it and I moved the wrong way and coffee went everywhere! I saved the computer and the newspapers. A very nice lady came over to help me clean it up. What was so frustrating was my writing a blog and losing it. Has that ever happened to you? Have you ever written something and lost it to cyber space? I've learned that from now on I am going to write my messages, then save them, then cut and paste them. That's advice for you and your friends, too. It's just too sad to lose hard work. Life is a journey and each of us has our own individual path. Sometimes we make choices and never know how those choices would impact so many people's lives. One family story that comes mind was about a decision your grandfather and I made to immigrate to Perth West Australia. The year was 1986, we were both born in South Africa where my family had lived for the past 40 years. My family had immigrated to South Africa from Scotland soon after World War11 had ended. My oldest sister was born in Scotland and the decision to immigrate was because my mother's sister had come to live in South Africa. Jem, your great grandmother was a very kind and gentle lady and you are called after her. You have a heart of gold and always try to be helpful and kind and I call you, "my special soul." Your grandfather, Mervyn was offered a position to be the Principal of a Jewish Day School. It was with much sadness but great anticipation of a new adventure that we left South Africa. We lived in Perth for only 3 short years and then we again immigrated to the United States where your grandfather was offered another Principal's post in Connecticut. I have often thought about those three short years and the impact on our family. In a nutshell, your parents were classmates and fell in love at a very young age. They both graduated high school and went on to do their undergraduate degrees in different countries. Your dad stayed in Perth with his family and your mom came with us to Connecticut. Their romance continued across the miles and neither of them were daunted by the fact that so many miles separated them. They worked, earned their passage to visit each other regularly during their vacations until they had graduated college and were able to be together permanently. Their wedding was the ultimate fairy tale and they are an example of family togetherness and the greatest love story. Jemma, I hope that this will give you a small insight into how your amazing parents started their journey and you and your siblings are a product of their dream and a "gift" to our family. This is Jemma’s sister and I am in 6th grade. Recently I went on a trip called Astro Camp. Only the students who are in honor society and earned at least 2 A's and 2 B's were permitted to participate. It is a science camp that hopefully many of you will get to attend. While there learned about the solar system and what its like to be on other planets besides earth. I engaged in a multitude of hands on experiments. For example, I ate dry ice and realized that it is incredibly cold! Since it is basically just steam, each person in our group got a potato chip and the scientist came around and put a little on each chip. Then we put it in our mouth and steam came out of our noses! It was super cool. I’m not a science person and I still thought it was a really phenomenal trip and gained a huge amount of knowledge. I hope you get the opportunity to go on this trip with your friends and teachers when you are in middle school. It was great seeing you this afternoon. I enjoyed picking you up from school, so that we could have a few minutes of private time to discuss any number of subjects. I know it's only been a week since I saw you, but either you've grown or I've shrunk. When are we going to measure you? It's way passed Papa's bedtime and the King's were leading the Sharks 1 - 0 at the first intermission. I sure hope they can hold on to force a game 7. Tomorrow night Uncle Bruce will be rooting for the Rangers to end the Flyer's season and move on to the next round. Did you know that ice hockey originated around 1800 in Windsor, where the boys of Canada’s first college, King’s College School, adapted the field game of Hurley to the ice of their favorite skating ponds and originated a new winter sport, Ice Hurley. Over a period of decades, Ice Hurley gradually developed into Ice Hockey. I learned that on-line. Do you know any other interesting facts about the game? It will be exciting for both of us to be back in uniform tomorrow for our baseball game. See you then. I am a friend of your grandmother, Ellen. I live in North Dakota, but I"ve been to California a few times. Have you ever been to North Dakota? We have had a very long winter and it is actually supposed to snow again tonight. I'm really ready for sping to be here so the grass can grow and everything can be new and beautiful again. I think your grandmother is a lovely lady and I'm so glad she is my friend. I know how important you are to her and your grandpa, too. I couldn't sleep last night. I don't know why. I just tossed and turned and then tried to put myself to sleep by remembering stories I had heard. Do you ever remember stories out of nowhere? Were they inspirational? Well, I think this one was for me. There was once a little girl, Olivia, 3 years old, who had an imaginary friend, Charlie Ravioli. Olivia would play with Charlie Ravioli everyday and they were the best of friends. But one day Charlie Ravioli didn’t show up to play, so Olivia called him on her play phone. As time went on, Olivia got sad. Charlie Ravioli didn’t have time for her, not to play and later, not time to talk either. I bet you are identifying with Olivia, feeling lonely and put off by others who don’t have time for you, but please also think about Charlie Ravioli. Are we Charlie Ravioli? Are there people in our lives who you don’t have time for? Are there people in our lives like Olivia, who look to us, feel we were part of their lives and then found we weren’t there? We can't be Charlie Ravioli. We need to be there for others. Even as 8 and 9 year olds, we need to care about other people, make time for them and be kind to them. We can't let bullies hurt other people and we have to be nice to those around us. It was my Rabbi who told this story and I will always remember it. It's a rule for me to live by. Do you have any words of wisdom that you use to guide yourself in your life? I would love to hear them. This is Jemma’s dad and I am very excited that Mrs. Yollis' 3rd grade class has a connection to and interacts with students in Australia via Skype calls and other communication mediums. I can proudly say I was born and grew up in Australia in the west coast city of Perth. I wanted to share with you a little known secret that is uniquely Australian and a "fair dinkum" (Australian terminology/slang for something that is true) Aussie delicacy which a large percentage of the population enjoys on a daily basis. This secret is Vegemite and it is one of the richest sources of Vitamin B. Vitamin B is a water-soluble vitamin that plays an important role in cell metabolism. Vegemite is a dark brown food paste/spread that is usually enjoyed on toast, crackers or as a sandwich. Much like peanut butter and jelly is a staple in the United States, Vegemite is the equivalent staple, yet a much healthier one in Australia. Did you know that over 22 million jars of Vegemite are sold every year…"FAIR DINKUM"!!! I hope all of Jemma’s "mates" get to try this exciting new flavor from "Down Under" someday. I forgot to ask if the doctor took off your boot – please let me know and tell me if your toe is ok. In the fall of 2012, I had surgery on my ankle and toe. There was some loose cartilage floating around in my ankle, so I went to see a surgeon, who is a foot and ankle specialist. Here’s how I found him – I called the 3 major sports teams in the area and spoke to the trainers of each of the teams – the Baltimore Orioles, The Washington Wizards, and the Ravens – 2 of the 3 trainers told me that they use the Foot and Ankle Reconstruction Institute in Baltimore, so that’s where I went! Cool, huh? Well, anyway, after the surgery, I had to wear a boot for about a month. Did you notice that when you wear a boot that people come up to you and ask about why you’re wearing a boot? Well, that happened to me and I met some pretty cool people who had the exact SAME surgery I had. The boot was GREAT – felt so very protected. At first, I couldn’t walk very well with the boot and needed crutches; then I got one of those scooters that you put your leg on with wheels and handle bars – like a bike. Ok, so here’s something that happened – I went to the hospital where I had the surgery done for an appointment with the surgeon to check on the progress of my foot. So I took my scooter and started scooting down the hallway to the doctor’s office. Well, the hallway soon turned into a slant—I was going really fast downhill and you know what? I couldn’t stop!! The brake wasn’t that strong, so I ran right into a woman and scared the living daylights out of her. I thought she was going to have a heart attack on the spot! I apologized profusely to her, but she had a hearing problem, so she didn’t hear anything I was saying. I learned to go slow after that! Pretty scary “Boot Camp” Story, huh? Wow, you wouldn't believe how hard it's raining here in Maryland. -- There is so much rain coming down that I thought I heard a voice telling me to gather 2 animals of every kind and build a very big boat!!! All the news stations on TV have been telling people not to go outside. I'm just hoping we won't lose power. -- That's AWFUL! Can you imagine what it must have been like when people didn't depend so much on electronic devices? -- Many years ago, we didn't have cell phones, or computers, or microwave ovens. There was no 'blogging. -- People wrote letters and went to the Post Office to mail them. There weren't even toaster ovens! Life is sure a lot easier today with all the electronic gadgets we take for granted! When I was in school as a boy, there weren't even little electronic calculators!!! So, I have a question for you and your class -- do you think it's easier to live in today's world with all the gadgets or do you think we've all become very lazy and too dependent on them? What do YOU think? I am Keira's Dad and as I began to read several posts I was very impressed on the amount of comments from the entire class. I was even more impressed at the family support and participation. If that was not enough, I found the level of writing by all involved to be magnificent. It is always good to challenge your mind and be as expressive as possible. One of the ways Keira and I do this is late at night around bedtime we share make believe stories that often revolve around a certain character named Keira who has a special blue jeep with yellow polka dots. There are many adventures involving this cute little girl and her special car. Somehow Keira always ends up saving the day! Do you find ways to open your mind? Can you share any of these experiences with us? I look forward to finding out! Maybe they will help me open up my mind further.